from The Essentials of Italian Cooking. What do you do with eighteen pounds of tomatoes, eight of which are Romas? Place yourself in Marcella’s hands. Another bonanza harvest of the Tanghetti’s nearly unsustainable tomato jungle on Saturday sent me flying to Marcella’s for a refresher course in tomato sauces. The recipe is deceptively simple. Like all the best cookbook writers, Marcella saves her most important lessons for the text before and after her recipes. Of all the words she deploys to supplement her basic recipes for tomato sauce, “evaporation” is the most crucial. “Reduction,” I suppose, is another way of putting it. She makes it clear that the cooking times in her recipes are not prescriptions. Thirty minutes may meander into a four-hour simmer. That’s what I did in this recipe. I believe I learn from Marcella for as long as the bindings of her cookbooks hold together. Even when I re-read her instructions I learn new elements of cooking. 1. Put either the prepared fresh tomatoes or the canned in a saucepan, add the carrot, celery, onion, and salt, and cook with no cover on the pan at a slow, steady simmer for 30 minutes. Stir from time to time. 2. Add the olive oil, raise the heat slightly to bring to a somewhat stronger simmer, and stir occasionally, while reducing the tomato to as much of a pulp as you can with the back of the spoon. Cook for 15 minutes, then taste and correcto for salt. May be frozen when done. Rather than focus on amounts of the ingredients I used (8 lbs tomatoes, 4 carrots, 5 stalks of celery, and 1 1/2 large onions, diced, 1-2 T kosher salt, and 3/4 cup of olive oil), I’ll explain how I incorporated Marcella’s thick description of the process. First of all, my “spiders” — those metal-mesh long-handled draining scoopers you find in Asian groceries — came in very handy both for immersing and extracting the tomatoes plunged into boiling water for 30 seconds. Peeling them is very easy, but the most labor-intensive part of the recipe. Marcella says that the broader and shallower the pot, the less time the sauce will take. The goal is to cook the vegetables until the tomatoes no longer taste raw. The more tomatoes you cook, the longer that process will take. She insists that you never cover the pot, for reasons, obviously, having to do with the evaporation. Nothing worse than a watery tomato sauce. Her one other serious admonishment is not to underseason the sauce. In other words, do not be faint-hearted with the salt. That’s easier to do if you’re using kosher salt, which is more forgiving in its salinity. When all the vegetables were in the pot, I brought it all to a simmer, reduced the heat to medium low and let it bubble for four hours. Smaller batches may also benefit from so long a cooking time. It’s a literally a matter of taste. I sampled the sauce every half hour or so. My original intention had been to smash the vegetables as they softened against the side of the pot. After a while of that, I decided, the hell with it. After four hours, I let the sauce cool a bit. Then I put small amounts in the food processor and pulsed. The sauce came out with the consistency I love in tomato sauce. I returned the sauce to the pot I cooked it in and simmered it another 30 minutes. 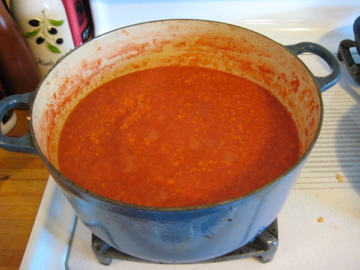 The olive oil adds a depth to the sauce similar to the one provided by meat. However, I didn’t add any for the first two hours. I forgot it, to tell the truth. Once I did, the delicious factor increased by a whole lot. I’m freezing most of the sauce I made, but returning a small portion to the Tanghetti’s as a tithe. It’s the sort of ingredient that feels like a luxury in the winter. Patricia Wells has a recipe I plan on adding here, a spaghetti “risotto” made with tomato sauce, that homemade sauce enhances beautifully. Now, what do I do with the other ten pounds? I see a lot of bufala in my future.